61% fewer calories than white rice. 100% vegetables. Gluten-free. No preservatives. 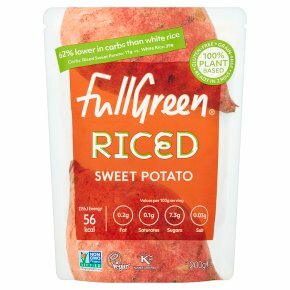 Non-GMO.Fullgreen Cauli & Vegi Rice are quick and easy, lower calorie carb alternatives made from riced vegetables. They also count as one of your 5 a day. Use it as a ?side' like rice; in low carb pizza bases, veg-filled stir-frys or hearty grain-free salads. Freshness sealed in Our pouches seal in the freshness of vegetables without any additives or preservatives. (2 1/2 minutes)Microwave in an uncovered bowl for the time shown. Reduce cooking time if your oven is more powerful than 900 watts. You can also microwave Cauli Rice in the pouch: just tear-off the top and cook. (2 1/2 minutes)Saute in a non-stick pan on a medium heat. There's no need for oil. For best results, add herbs and spices and season to your taste. Serve steaming hot.